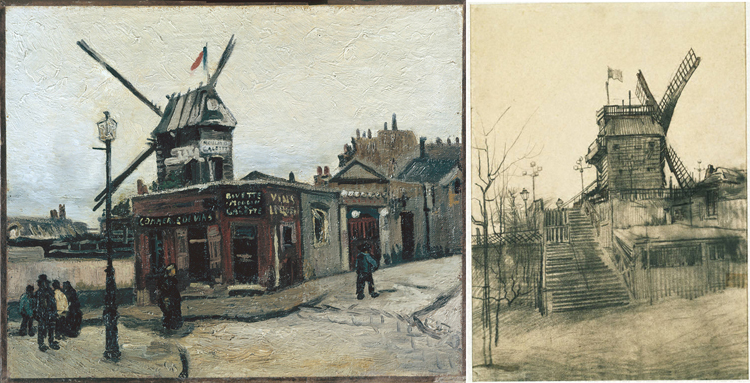 (Right) Vincent van Gogh, Le Moulin de la Galette, 1886. Oil on canvas, 15 x 18 1/4 in. Nationalgalerie, Staatliche Museen, Berlin, Germany. (Left) Vincent van Gogh, Moulin de la Galette, 1887, Pencil and ink on paper 21 1/4 x 15 5/8 in. ; 53.975 x 39.6875 cm.. Acquired 1953. The Phillips Collection, Washington DC. In the second-to-last Sunday of Van Gogh Repetitions, we broke a record! 2,305 visitors came out of the cold and into the museum, surpassing our previous daily attendance record set only a few weeks ago on December 26 with 2,276 visitors. If you haven’t been a part of these notable crowds, be sure to come see the show before it closes February 2. This entry was posted in Experiment Station and tagged attendance, crowds, van Gogh. Bookmark the permalink.